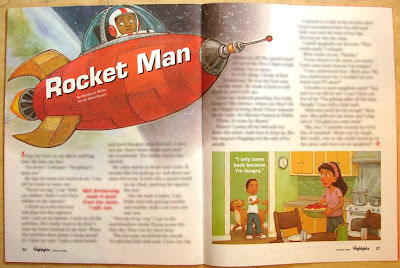 This month in Highlights magazine I have a couple illustrations for a short story called ‘Rocket Man’ written by Marilyn Phifer. This was a very cute story and the illustrations were super fun to do. You always lose a little something when it’s printed on newsprint type of paper so here’s a scan of the original. 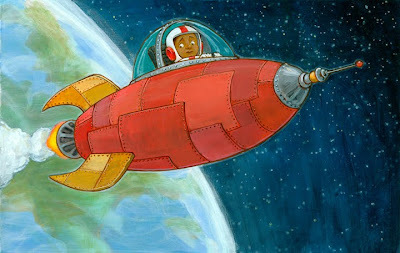 i LOVE love LOVE the patchwork of the rocket. what made you decide to do it that way instead of symetrical? I forgot to mention it but a little while ago I was at JiffyLube and came across this issue of Highlights. I knew it was your stuff before I even checked. Great work man. Very Cut! love that you still work with real paint! Very nice! I love your rendering technique.